People of Christian Maturity Ministries, Inc. Owning Our Salvation means knowing with certainty that God is continually with us, that our broken lives were accepted by Him in exchange for the renewed lives He has given us; that we live securely in His eternal presence, having received infinite unearned value as adopted members of His family; that there is never a need to ask Him to be with us, because He is always with us, just as He promised; that we are confident and thankful for His presence, living with Him in a relationship of everlasting love and forgiveness. Growing Our New Nature means cultivating the unique identity God intended when He made us, developing that identity through repentance and prayer, while abandoning the behaviors of our old worldly identity; being confident and thankful that He enables us to become who He made us to be; knowing that our task is to labor together with Him to resist the habits of our old nature, as we nurture and grow our new nature; learning to see what is true from his perspective, with assurance that He is always with us to help and strengthen us, even in times of discouragement and despair. Being Thankful for All Things means embracing with total acceptance whatever circumstances we encounter, expressing thankfulness continually, no matter how painful or difficult our situations may be, just as Christ gave thanks before giving up His life, knowing that God is always with us, that He is always in control, that He uses our hardships in mysterious and incomprehensible ways for unimaginable good, to promote and enable the training and growth of our new Godly identity. Developing Christian Maturity means living a life that is motivated by Christ who lives within us; expressing thankfulness in every situation, as He enables us to grow our new identity; resisting the temptations of our old identity, as we exemplify Godly character to others, continually maturing and becoming more like Him until the day we finally see Him, face-to-face. These Biblical principles were taught and chronicled by Dr. Maurice E. Wagner, pastor, psychologist, and founder of Christian Maturity Ministries, Inc. The purpose of this ministry is to equip Christians in developing their sense of personal identity, the quality of their personal relationships, and the depth and closeness of their relationship with God, all in accord with the fundamental teachings in God’s Word. Terri offers a wide variety of courses in the “Add Meaning to Living” series. 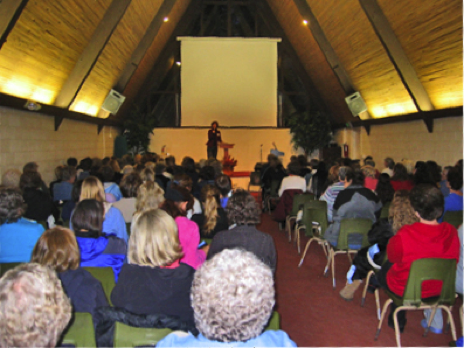 She has been speaking in seminars, workshops, class settings and retreats in California and in other states. She has the ability to help women by presenting Gods Word and Dr. Wagner’s materials through her unique word pictures, fresh insights and practical applications to life. Her main objective through all of her work is to reveal to women how it is possible to have a complete and whole identity through God the Father, God the Son and God the Holy Spirit. She is able to honor your requests for special topics, minister in song and/or share her artwork for your event. The Joy of His Presence - God heard You, but have you heard Him?